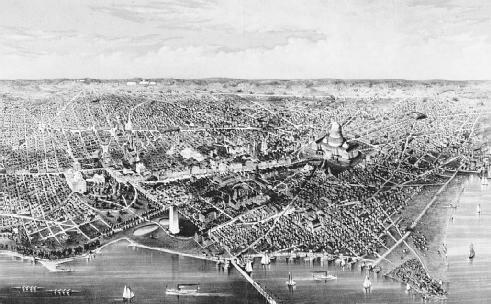 An 1880 drawing of the District of Columbia by C.R. Parsons. Article 1, Section 8 of the U.S. Constitution grants Congress complete legislative authority over the district. "To exercise exclusive Legislation in all Cases whatsoever, over such District (not exceeding ten miles square) as may, by Cession of particular States, and the acceptance of Congress, become the Seat of the Government of the United States" (U.S. Const. Art. I, § 8). The U.S. Constitution, with this proclamation, left the legal formation of a national capital up to the U.S. Congress. To this day, the District of Columbia is neither a state nor a territory and remains under congressional jurisdiction. The location of the national capital was born out of a political compromise between the northern and southern states after the United States had achieved its independence. The South feared that the North would have too much influence if the capital were placed in a northern city. The North demanded federal assistance in paying its Revolutionary War debt, something the South was strongly against. Alexander Hamilton initiated a compromise whereby the federal government would pay off the war debt in return for locating the capital between the states of Maryland and Virginia on the Potomac River. In 1800, Virginia and Maryland ceded portions of land to the federal government. The citizens living in the new capital were required to give up all the political rights they had enjoyed as inhabitants of Maryland and Virginia. In return, Congress, which had exclusive power over the district, would allow them some form of self-government. In 1802, Congress called for an appointed mayor and an elected council in the district. By 1820, the election of the mayor was also permitted. This form of representative government lasted in the district until 1874, when Congress abolished the citizens' right to vote for their local officials and established a three-person board of commissioners appointed by the president. For over one hundred years, the residents of the District of Columbia were denied the democratic right to elected local representation. Although residents of the district had always been required to pay federal Income Tax and serve in the military, their right to vote in presidential elections was denied until the 1961 passage of the Twenty-Third Amendment to the Constitution. This amendment granted the district a number of votes in the Electoral College, not to exceed the number given to the least populous state. In 1967, through an Executive Order (Exec. Order No. 11379, 32 FR 15625, 1967 WL 7776 [Pres. ]), President lyndon b. johnson did away with the three-member board of commissioners and appointed a mayor and a council for the district. In 1970, the district was given back its nonvoting delegate in Congress. But this still did not satisfy residents who demanded full self-determination. Congress then passed the District Home Rule Act of 1973 (Pub. L. 93-198, Dec. 24, 1973, 87 Stat. 774), and restored to the citizens their right to vote for a local government. For the first time in exactly a hundred years, the residents of the District of Columbia were able to vote for a mayor and a 13-member council. The Constitution granted Congress complete legislative authority over the District of Columbia. Congress alone has the jurisdiction to expand the district's powers over local government affairs. It also has the jurisdiction to contract those same powers. Congress, through the Home Rule Act, dictated the legislative powers to the district council and the executive powers to the mayor. Advisory neighborhood commissions, which are groups elected by the residents, advise the council on matters of public policy. Congress still retains ultimate legislative authority through its power to Veto any of the district's legislation. Besides the citizens of U.S. territories, district residents are the only U.S. citizens without full representation in Congress and with federal limitations on their own local government. Advocates of statehood rebel against such restrictions. They argue that because the district's congressional delegate is not allowed to vote, residents are subject to a fundamental democratic wrong, taxation without representation. They add that because Congress retains control over the city's purse strings, city officials are powerless in raising more revenue. Federal restrictions on taxation have prevented the district from taxing commuters as have some other U.S. cities, which could have given the district a huge tax windfall. Opponents of statehood argue that the District of Columbia belongs to all U.S. citizens, and therefore all citizens should have a say in how it is managed. Constitutionally, Congress has complete authority over the district, and to have it otherwise would require a constitutional amendment (supporters dismiss this argument, pointing out that 37 states were allowed into the Union through only a simple majority vote in Congress). If the district were to become an independent state, some opponents argue, the federal government would have to abide by the laws of this new state. Opponents of statehood also maintain that the district's power needs to be checked by Congress because of the district's financial difficulties. The push toward statehood has become a partisan issue, with the Democratic Party generally in favor of it and the Republican Party generally opposed. One reason for this division is the political makeup of the city, which is predominantly Democratic. Statehood would add more Democratic members to the House and the Senate. When the Democrats won the White House in 1992, the stage was set for the statehood issue to move forward through the 103d Congress. On November 21, 1993, the House considered Bill 51, calling for the creation of New Columbia, the nation's fifty-first state. Democrats spoke in favor of statehood, saying it would give D.C. residents the same benefits of citizenship that are enjoyed by other U.S. citizens. Republicans spoke out against it, saying the city was unable to govern itself. Republican sentiments carried the day, defeating the bill by a vote of 277–153. After Congress rejected the idea of statehood for the district, D.C. residents felt they had exhausted their legislative options for change. They explored other ways of increasing their influence in Congress, but again the fact that their representative could not vote in Congress posed a major roadblock. A group of residents sought to overcome this limitation by filing a federal lawsuit that challenged the status quo. Lois Adams and 75 other D.C. residents filed the lawsuit against the president and Congress, arguing that it was unjust that they pay taxes and defend the country in times of war, yet they could not send elected representatives to vote on taxes and war. They claimed that this deprived them of Equal Protection of the law and denied them a republican form of government. They also argued that this deprivation violated their due process rights and abridged their Privileges and Immunities as citizens of the United States. A special three-judge panel heard the case but in the end rejected these arguments. In Adams v. Clinton, 90 F.Supp.2d 35 (D.C. 2000), the court addressed both jurisdictional and constitutional issues. Regarding jurisdiction, the executive and legislative branches contended that the court had no right to even hear the case because the plaintiffs raised issues that were not subject to review by the judicial branch. However, the court rejected the idea that the issues were political questions beyond its reach and reviewed the merits of the case. The court looked at the language of the Constitution, as well as history and legal precedent, in making is decisions. It first held that Article I of the Constitution repeatedly refers to "each state," thereby demonstrating that the term did not refer generally to all the people of the United States but to citizens of individual states. Tying the right to Congressional representation to statehood was reinforced by the fact that residents of U.S. territories cannot elect voting representatives to Congress. In addition, history and precedent revealed that the District of Columbia had never been considered a "state" for constitutional purposes. Therefore, the direct constitutional challenge had no merit. The court rejected an even more novel theory advanced by the plaintiffs that they were entitled to vote in Maryland elections because of their "residual citizenship." This theory relies on the fact that residents of the land ceded by Maryland to form the district continued to vote in Maryland elections between 1790 and 1801, when Congress assumed jurisdiction and provided for the district's government. The court dismissed this claim, noting that a 1964 court decision had rejected the concept of residual citizenship based on the fact that former residents of Maryland lost their state citizenship when the District of Columbia separated from it. Finally, the court concluded that the equal protection clause of the Fourteenth Amendment could not be used to strike down another constitutional provision. Though the court found that Congress and the Executive Branch had failed to give a compelling reason for denying D.C. residents voting representatives, the denial was based on a provision of Article I. Unlike a statute that contains illegal classifications, the constitution cannot be ruled unconstitutional. Therefore, D.C. residents had to convince Congress to either grant it statehood or pass a constitutional amendment that would allow voting representatives from the district. The courts of the District of Columbia were established by an act of Congress. Originally, federal courts heard controversies that arose in the District of Columbia. Disputes over federal or district law came under the jurisdiction of the federal district courts. Appeals went from the district courts to the Court of Appeals for the District of Columbia Circuit, and then to the U.S. Supreme Court. Just as the legislative branch of the district government became less dependent on the federal system in the 1970s, so too did the courts. The district court system was completely reorganized under the District of Columbia Court Reform and Criminal Procedure Act of 1970 (Pub. L. 91-358, July 29, 1970, 84 Stat. 473; Pub. L. 99-573, § 17, Oct. 28, 1973, 100 Stat. 3234, 3235). The U.S. District court no longer has jurisdiction over criminal or civil actions occurring under D.C. law. These cases are now heard by the district's new trial court, the Superior Court. The District of Columbia Court of Appeals has jurisdiction to review decisions of the Superior Court. Harris, Charles Wesley. 1995. The Conflict of Federal and Local Interests. Washington D.C.: Georgetown Univ. Press. Kofie, Nelson. 1999. Race, Class, and the Struggle for Neighborhood in Washington, D.C. New York: Garland Press. Markham, Steven. 1998. Statehood for the District of Columbia. Washington, D.C.: National Legal Center for the Public Interest. Schrag, Philip G. 1985. Behind the Scenes: The Politics of a Constitutional Convention. Washington D.C.: Georgetown Univ. Press. DISTRICT OF COLUMBIA. The name of a district of country, ten miles square, situate between the states of Maryland and Virginia, over which the national government has exclusive jurisdiction. By the constitution, congress may " exercise exclusive jurisdiction in all cases whatsoever, over such district, not exceeding ten miles square, as may, by, cession of particular states, and the acceptance of congress, become the seat of government of the United States." In pursuance of this authority, the states of Maryland and Virginia, ceded to the United States, a small territory on the banks of the Potomac, and congress, by the Act of July 16, 1790, accepted the same for the permanent seat of the government of the United States. The act provides for the removal of the seat of government from the city of Philadelphia to the District of Columbia, on the first Monday of December, 1800. It is also provided, that the laws of the state, within such district, shall not be affected by the acceptance, until the time fixed for the removal of the government thereto, and until congress shall otherwise by law provide. 2. It seems that the District of Columbia, and the territorial districts of the United States, are not states within the meaning of the constitution, and of the judiciary act, so as to enable a citizen thereof to sue a citizen of one of the states in the federal courts. 2 Cranch, 445; 1 Wheat, 91. 3. By the Act of July 11, 1846, congress retroceded the county of Alexandria, part of the District of Columbia, to the state of Virginia. Of all of the voucher bills likely to receive attention in the 106th Congress, the one for the District of Columbia has the best odds of being reintroduced and sent to the president's desk again. Judge Rainey Ransom Brandt has served as a Magistrate Judge in the Criminal Division of the Superior Court of the District of Columbia since 2013, where she is currently the trial team leader for her calendar assignment. Our desire has always been to resolve this matter in a way that recognizes our status as a manufacturer and solidifies our status as a leading supplier of high-quality, low-price products in the District of Columbia. As part of the agreement, CTC will release more than $31 million from its escrow accounts to the states and the District of Columbia. With the Clearinghouse currently processing over $60 million in transactions per year, the District of Columbia Office of the Attorney General, Child Support Services Division (CSSD) took the lead in developing a successful public/private partnership with SMI to add Check 21 as an essential component of their child support payment services. The District of Columbia Housing Authority (DCHA) is dedicated to enhancing the quality of life in the District of Columbia by providing and effectively managing affordable housing which is diverse, well maintained, and aesthetically pleasing for those whose circumstances prevent them from competing in the general marketplace. According to Mike Latessa, director of the Office of Unified Communications, "The District of Columbia is committed to public safety and first-class customer service. This report presents the results for District of Columbia Public Schools' (DCPS') student achievement in reading. Aetna (NYSE:AET) announced today that for 2007 it is expanding the availability of its Medicare Advantage medical products to three new states, adding new counties within states it already serves, and providing Medicare Part D prescription drug products to auto-enrolled beneficiaries in an additional 28 states and the District of Columbia. An inmate filed a [section] 1983 action against the District of Columbia and several employees of its corrections department, alleging unconstitutional conditions of confinement and denial of medical care. SHL will offer SierraRx(SM), a stand-alone PDP, in 30 states and the District of Columbia. In the 2009 "State Teacher Policy Yearbook", District of Columbia had the following grades: (1) Delivering Well Prepared Teachers (D); (2) Expanding the Teaching Pool (D+); (3) Identifying Effective Teachers (F); (4) Retaining Effective Teachers (D-); and (5) Exiting Ineffective Teachers (D+). District of Canterbury Credit Union Ltd.
District of Columbia Association for Retarded Citizens, Inc.